An assembly was held this morning at St James Church of England High School, in Farnworth, Bolton in memory of the three young people killed in France last week. 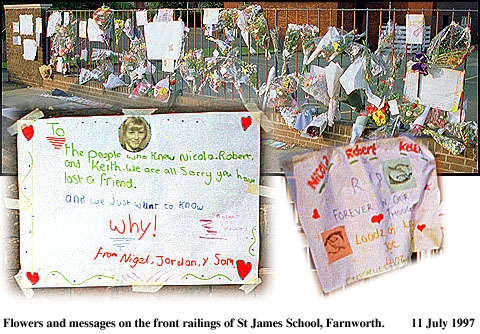 1000 pupils, teachers and others connected with the school heard headmaster David Bowes pay tribute to Nicola Moore, aged 15, Robert Boardman and Keith Ridding, both 14: "They were young, so young and strong and filled with promise. So vital, so radiant, giving so much joy wherever they went." The bodies of Robert and Keith, who were close friends, will be buried together after a joint funeral service at St Ann's Church, Clifton. The tragedy has made national headlines here. All the survivors, including the injured driver of the bus, have now been flown back from France. Manchester Airport and Liverpool Airport are to co-operate for mutual growth, it was announced today. After previous rivalry, the two North West airports have been told by Transport Minister John Prescott to work together as part of an integrated transport policy. Manchester Airport Chief Executive Geoff Muirhead said however that the decision had no bearing on the 2nd Runway, which would still have been needed even if the airports had decided to work together before. There are plans to link the two airports by rail, and for Liverpool to target specific areas of the air transport market. Liverpool Airport is now owned by Peel Holdings, operators of the Manchester Ship Canal. Rivalry between Manchester and Liverpool has existed for many years. The Manchester Ship Canal was opened in the late 19th century so Manchester wouldn't have to rely on the port of Liverpool. But nowadays there are plans for the two cities to work together in many other areas, for example as part of a regional development authority. Do you agree with this, or do you think Manchester and Liverpool should each look after their own? Please send your opinion. Groups of local residents opposed to the second runway went on a protest walk on Saturday, headed by local MP Martin Bell and ex-Church of England envoy Terry Waite. Martin Bell said he supported the runway at first, but based on the feelings of his constituents, had since revised his opinion. This was probably the last time people will be able walk on the affected stretch of countryside, as work to prepare for construction of the runway will start this week. Heaton Park is to benefit from a £3.4 million lottery grant. To celebrate the news, a sports day was held at the park today, attended by local schoolchildren. Sir Bobby Charlton paid a visit, and commented favourably on the award. He drew attention to the fact that the city' parks are underused and in a bad state of repair. Let's hope more financial support is found to renovate the city's other parks, such as Alexandra Park and Boggart Hole Clough. Talking of money, the Council are said to have made a loss of £800,000 on the recent table tennis championships at GMEX, and are considering placing a levy on city businesses to pay for future events. They say that hotels, restaurants and shops benefited considerably from the presence of the table tennis contestants, but made no contribution to the cost of holding the tournament. The losses were incurred because there were 37% more contestants than expected, and there was confusion over the TV rights. The organisers were expecting to gain income from tv coverage, but it was later found out that rights had already been given to other companies. Whether the city suffers financial loss from staging the Commonwealth Games in 2002 remains to be seen. Manchester has been voted the fourth best city in Britain to work in. It was beaten by Newcastle, Glasgow and Milton Keynes. It shares fourth place with several other cities, but came top for its choice of good places to eat and drink. It fared less well as a "clean and unpolluted" place to work, and came bottom of the list on the basis of having "pleasant places to sit outside". One of Manchester's most pleasant, and seemingly most underused public parks is Platt Fields. 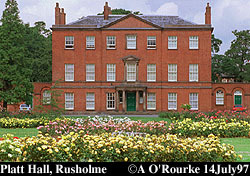 Fifty years ago last week, the Gallery of English Costume opened at Platt Hall. Read about this and other interesting occurrences this week in 1947 in Manchester Eyewitness. I'M HOPING THE BBC FEATURE WILL GO AHEAD THIS WEEK. WATCH THIS SPACE AND KEEP VISITING EYEWITNESS IN MANCHESTER.